Your car-buying prayers have been answered. If you’ve been seeking a luxury SUV near the Cobb Country, Georgia area, you should turn your focus to the 2019 Buick Enclave. Similarly, once you establish that this is the perfect target for yourself, you should turn your focus to Carl Black Kennesaw, as the dealership truly provides customers with an optimal buying experience. Does it get much better than that? Buick is generally known for its opulence, and for very good reason. Inside and out, this SUV truly screams “luxury,” and this is a big reason why the nameplate is consistently regarded as one of the most desirable options in the segment. However, the vehicle delivers so much more than style and luxury. If you’re looking for an SUV that manages to deliver a unique blend of power (as well as efficiency), technology, and safety, you can’t do much better than the 2019 Buick Enclave. Of course, you don’t have to take our word for it. Rather, you can explore these specific amenities and specs for yourself. Explore everything the 2019 Buick Enclave provides to drivers, and you’ll soon be itching to pursue the SUV at a local dealership. Car brands seemingly cram as many engine options as they can in their nameplates. While the options are appreciated, the number of offerings usually means the company doesn’t end up producing a single premier option. After all, they’ve wasted their efforts on multiple engine offerings, meaning all of the systems end up suffering. Well, Buick has managed to do it right when it comes to their 2019 Enclave. Engineers instead focused in on one particular engine offering, allowing the brand to better refine their premier option. The 3.6-liter V6 engine teams up with a nine-speed automatic transmission to deliver an impressive 310 horsepower, a number that’s rarely seen in a luxury SUV. Surprisingly, the system also manages to be incredibly fuel efficient. Thanks to fuel-saving features like the Stop/Start technology, drivers can ultimately anticipate up to a 26-mile-per-gallon highway fuel efficiency. You’ll be hard pressed to find this kind of number in competing SUVs. Of course, the brand included a number of mechanical features that are intended to provide owners with the optimal driving experience. The five-link rear suspension system promises optimal steering, while the intelligent all-wheel drive system provides unmatched traction. You might not have necessarily expected your luxury SUV to be capable of delivering so much power. Well, this is just another reason why the 2019 Buick Enclave really isn’t your standard, typical SUV. 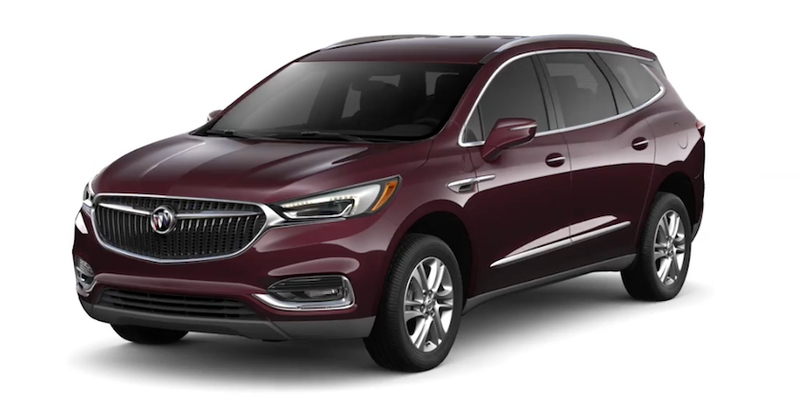 The 2019 Buick Enclave is one of the most luxurious vehicles on the road, and the SUV predictably provides drivers with an assortment of features and amenities that will boost the entire driving experience. It starts with the SUV’s spacious interior, as drivers will have more than enough space to fit any cargo or equipment they’d need for a trip. The vehicle delivers a roomy 23.6-cubic-feet of space behind the third row, and that can be increased to 58-cubic-feet of space behind the second row. The Smart Slide second-row seating can easily be moved around for third-row access, and drivers can also take advantage of the abundance of passenger space (the SUV can ultimately fit up to seven passengers). Of course, the 2019 Buick Enclave is also equipped with functions that will boost a driver’s enjoyment of their new SUV. Drivers can access the Buick Infotainment System, which is accessible via the eight-inch diagonal touchscreen. Whether you need access to radio or navigation, it’s easy to access thanks to this creative technology. Furthermore, thanks to the Apple CarPlay and Android Auto compatibility, drivers will never have any issues connecting their smartphone to their SUV, allowing them to safely make phone calls or send text messages. Other inclusions like the 4G LTE Wi-Fi will provide you with a strong wireless internet connection at all times, while the QuietTuning technology will allow you to better focus on your preferred tunes. Regardless of what amenity you’re capitalizing on, you’ll appreciate all of the features that are squeezed into the 2019 Buick Enclave. You’re going to be spending the majority of your time inside your new SUV, so you might as well enjoy it. Well, we’re confident you’ll love all of the advantages and amenities that engineers included in their 2019 Buick Enclave, all leading to a one-of-a-kind driving experience. You’ll be able to keep your 2019 Buick Enclave in one piece thanks to the SUV’s array of safety functions. These features are intended to prevent accidents from occurring altogether, and they’ll also come in handy if you do find yourself in a collision. Inclusions like the Forward Collision Alert will play a major role in helping drivers to avoid devastating collisions. This feature will alert the driver of an impending crash, and the driver will have enough time to adjust their path thanks to the audible and visual cues. If the driver fails to react accordingly, the Low Speed Forward Automatic Braking will take over. This inclusion can automatically reduce the speed of your SUV, thus reducing the chance of injury. The Front Pedestrian Braking plays a similar role, as you’ll be better prepared for any pedestrians while traveling in the city. Even inclusions like the Surround Vision Camera can keep occupants safe. The system provides the driver with a “bird’s eye” view of their SUV, allowing them to constantly monitor everything that’s happening around the ride. In other words, if a vehicle is about to cross behind your Enclave, you’ll already know about it. In the event that you do end up in a crash, the 2019 Buick Enclave has your back. The OnStar Safety and Security system includes a number of notable features, including Automatic Crash Response, Emergency Services, and Roadside Assistance. Therefore, if you need any help following a crash, assistance is only a click away. The 2019 Buick Enclave will do everything in its power to prevent an accident from occurring in the first place. In the event of a crash, you can rest easy knowing that the SUV has your back. Of course, the 2019 Buick Enclave is considered to be a luxury ride, and a big reason for this sentiment can be attributed to the exterior amenities. While many of these features apply to the cosmetics of the nameplate, they also serve to boost convenience. This all leads to a stylish, enjoyable driving experience. For instance, the Power Liftgate makes it more than easy to load all of your groceries and cargo inside of your vehicle. Owners will simply place their foot under the LED logo projection, and they’ll have easy access to the rear of their SUV. This way, you won’t have to finagle with your keys as you’re attempting to load your groceries or luggage. Meanwhile, the Power Moonroof allows fresh air to flood into the interior, keeping occupants comfortable and content at all times. Cosmetically, your fellow drivers will be enticed by the sporty signature grille, which includes the brand’s renowned tricolor badge. Engineers even added winged LED headlamps, which are as eye-catching as they are practical. Of course, words can only do these amenities so much justice… you should truly check them out for yourself to really understand why the nameplate is so impressive. The 2019 Buick Enclave is known for its luxury and the exterior of the SUV does a whole lot to hit this point home. Are you looking for the premier buying experience as you’re shopping for your new 2019 Buick Enclave? Well, that can be easier said than done, as many dealerships tend to be more focused on sales than customers. That’s not the case if you visit Carl Black Kennesaw. In addition to our vast inventory and competitive pricing, we provide a number of additional advantages that will come in handy throughout your car search. For instance, our service department is in place to fix up any issues you come across with your new SUV, while the finance department assures that you can afford the nameplate in the first place. The flexible hours are also great for buyers. The sales department is open seven days a week, meaning you can always visit on the weekends. Plus, we don’t close the dealership until 9pm during the work week, providing you with plenty of time to browse their selections after you’ve left work. The same goes for our service department, which also has incredibly flexible hours. So don’t worry about tossing away your schedule in order to visit Carl Black Kennesaw… we’re confident you’ll be able to find the time to visit us. Best of all, there are hundreds of new vehicles sitting on the lot, including Buicks, Chevys, and GMCs. Whether you’re seeking a smaller sedan, a hulking pickup truck, or a luxury SUV, you’ll certainly find it at Carl Black Kennesaw. If you live close to Cobb Country, Georgia, there are a number of reasons why Carl Black Kennesaw is the perfect place to purchase your new luxury SUV.